As a musician, in a market that is often described as “saturated”, it’s easy to feel defeated before you’ve even begun. No matter how good your music is, if you don’t promote it cleverly, it will likely get lost. While social media can be a great way start (see below), it is definitely not the only way, and there are a range of tips and techniques to help you maximise your musical presence and potential. 79.5% of internet users worldwide are active on social media, so using social platforms wisely is of the utmost importance when self-promoting. When interacting with other musicians and music lovers or contributing to the conversation on music related pages/groups, keep the comments concise and relevant — do not spam thoughtlessly. This will help maintain your reputation and may help to build your following. Whether you are writing a blog, posting a tweet or composing a Facebook post, make sure you are consistent in how you communicate. Rather than linking your accounts, so one post syndicates to all, look to diversify your posts across different platforms. Focus on the strengths of each and aim to add value and think: Why would a Facebook follower want to follow me on Instagram — What is in it for them? While social media platforms are known to use algorithms which can choke your post-visibility, this approach will help to expand your reach. Radio airplay is an effective way to get your music heard. Many national and local stations have shows set up specifically to showcase new talent. When contacting a radio station, reach out professionally. Make sure your promo CD is polished and ready to be heard. Send it to decision makers at the stations where you are interested in being featured and keep track of those you have sent it to. You may benefit from first reaching out to university and community stations as this may lead to airplay on bigger, commercial radio shows. The decision to play your music may well rest on how much radio time it’s had on smaller stations. Having your music featured on a well-known music blog/website can have a significant impact on your fanbase. However, before you reach out, research which blogs feature music of a similar genre or style to your own. Again, keep it professional — include links to your social media accounts as well as polished tracks on reputable platforms like YouTube and SoundCloud. Interested to know more about placing your music on music blogs? Take a look at our in-depth guide: How to Get Featured on Music Blogs! Having your own space to document your musical journey is a great way for interested parties to track your progress. 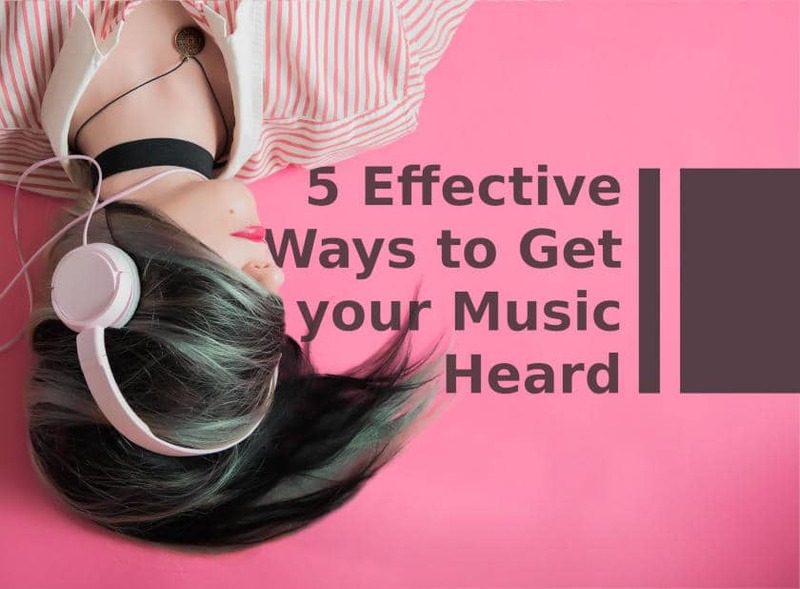 You can also cover wider topics such as your chosen music genre and artists which inspire you — featuring upcoming artists can help with cross promotion and may lead to future collaboration opportunities. Update the blog consistently — begin slowly — posting, say, monthly or fortnightly. If you find you have more time to invest, increase the frequency of posts, but be careful not to over-commit. Email is a great way to grow your fanbase and and reach out to your listeners. An opt-in mailing list means you can keep your subscribers in the loop and ensure they are aware of new tracks as and when you release them. Growing your mailing list is straightforward: when you meet people who seem interested in your music, simply ask them if you can send over a sample via email. When you do, ask if they would like to be added to your mailing list. You could also include a sign up form on your website, social media pages and at the end of blog posts — offering an incentive, such as an exclusive track/remix. As your mailing list grows, so will the number of people your music reaches. Little will gain you more attention than performing live. Whether busking, performing at open mic nights, playing festivals or entering competitions; playing live makes it easy to connect with new audiences. For best results, focus on playing to larger crowds and in places where your musical style will be best received. If you are busking, concentrate on areas where there is a high volume of foot traffic and enough space to draw a crowd. Wherever you choose to perform, make it clear who you are, so your audience can find and connect with you afterwards. All of your communication should be branded! Keep this simple and consistent. Use the same avatar on each platform and social media profile (consistency increases the likelihood of being recognised and remembered) and don’t forget to include links to your profiles in your email signature and at the end of blog posts. While many of these techniques are free, it is useful to put aside a small amount of money each month for marketing. Paying for music promotion is a guaranteed way to get more listeners. There are a number of services available and it is worth choosing one or two to get your music career moving. Have we missed anything? We would love to know what you do to get your music heard. Let us know in the comments below.